While discussing dhb’s chamois choice during the 2011 presentation, we were surprised to learn that all the winter tights dhb has lined up for the coming season have a Cytech Elastic Interface pad in them. We’ve been super-impressed with these Italian pads since they were first used by Assos and while we knew there was a range, we had no idea of the actual differences between chamois. We needed to find out more. Two weeks and a very early morning flight to Italy later, we found ourselves in the heartland of Italy’s sports clothing manufacturing – Montebelluna. Cytech sprang into existence in 2000. The new millennium saw two cousins (it is always family in Italy) leave their comfortable, secure positions at De Marchi clothing – founded itself by their grandfather in 1946 – and set up a company dedicated to producing the best chamois on the market. As serious cyclists, they were disappointed with the chamois producers’ apparent inability or lack of interest in improving this most vital part of a cyclists’ gear. It wasn’t long before the big collaborations began. In November 2001, they began discussions with Assos about improving the function of shorts padding. “Why should we have an elastic garment with a solid object at its core?” Both companies had been thinking the same thing, and decided to collaborate on what became Cytech’s raison d’être: the Elastic Interface. There were many problems. Sourcing a form of foam that was elastic enough yet still breathable was the biggest. 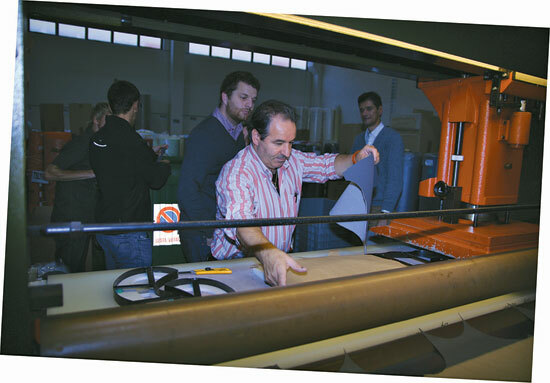 Once resolved, a collaboration with the University of Padua allowed Cytech to bring a scientific angle to product development. Discovering where pressure points are situated – and how they move as the pelvis rotates on the bike – it was possible to work out where the padding should be sited; where it needed to be more supportive and where bulk could be reduced. This work is ongoing and, to date, Cytech uses up to five different foam densities from 40 right up to 120kg/m3 in high-end pads. The research and field-testing also showed that the size and fixing of individual pieces of foam also have a huge impact on shorts’ feel on the bike. With both a thermal forming and stitched design facility, Cytech is now able to produce chamois to almost any customer requirement. With Cytech’s range consisting of 59 different designs – with models for road, mtb, tri and indoor cycling – and the custom pad business being considerable, one thing is certain: Cytech’s pads may all be well made, but just because they share a logo, they are far from being equal. During our visit, the word ‘performance’ popped up continually. It is this obsession with continual improvement that has – no doubt – led to Cytech’s success. Not only do many clothing manufacturers use its ‘standard’ pads (albeit often in a preferred colour), but the company also undertakes a huge amount of custom work. This can be a collaboration with Cytech’s designers – taking various elements from existing designs and reworking into a new pad, or producing a product designed by the clothing company but using Cytech’s huge knowledge and inventory of locally sourced foams, gels and fabrics. 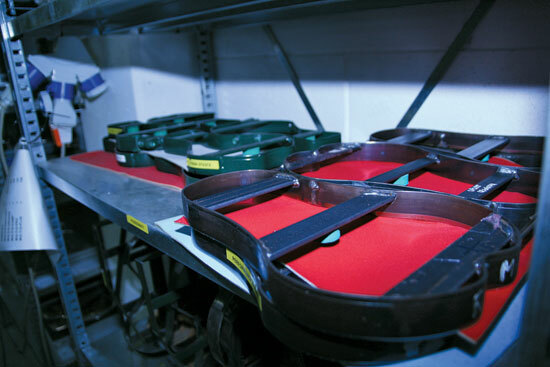 These custom pads (colour options are classed as standard product) make up 35-40 per cent of Cytech’s business. DHB’s pads may all share the Cytech logo but, even at a glance, it’s easy to spot major differences. With the tights ranging from £38-£75, both the intended user and selling price are very different. The standard Pace tights use the Race chamois; an Elastic Interface Technology pad with anti-chafing fabrics that are far from the bottom of the Cytech pile. When you rise to the Pace Roubaix, Cytech’s Giro chamois is included. Dual-density foam ranging from 60-80kg/m3 and 3-10mm combines with three-dimensional construction to reduce bunching. In the bells-and-whistles Pace WP SuperRoubaix tights the Tour pad uses triple density foam from 60-120 kg/m3, ranging in thickness from 3-14mm. Cytech firmly believes that the female anatomy requires a different chamois. Its university collaboration and extensive field testing has shown the need for a larger amount of padding in the central area to reduce pressure points in the softer, fleshy areas. Dhb users benefit from this, and as the Pace Roubaix is the highest-spec ladies’ tight, you can get the top level of protection and comfort of the ladies Tour pad for £30 less than the chaps’ version.